It takes years of riding experience, design, development and testing to produce a technical winter glove. The 45NRTH Sturmfist 4 is no exception. 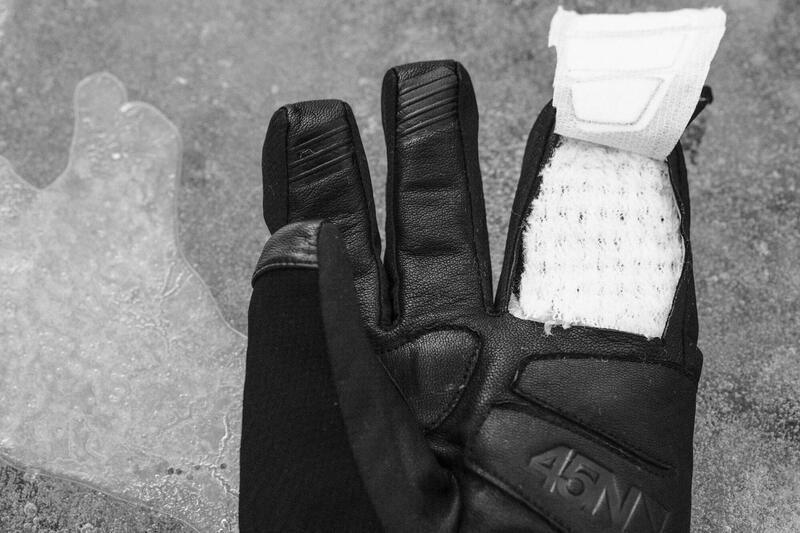 From day one at 45NRTH, our mission has been to deliver comfort and control via hands, feet and traction. Right next to footwear, gloves have been a central focus of our product innovation. 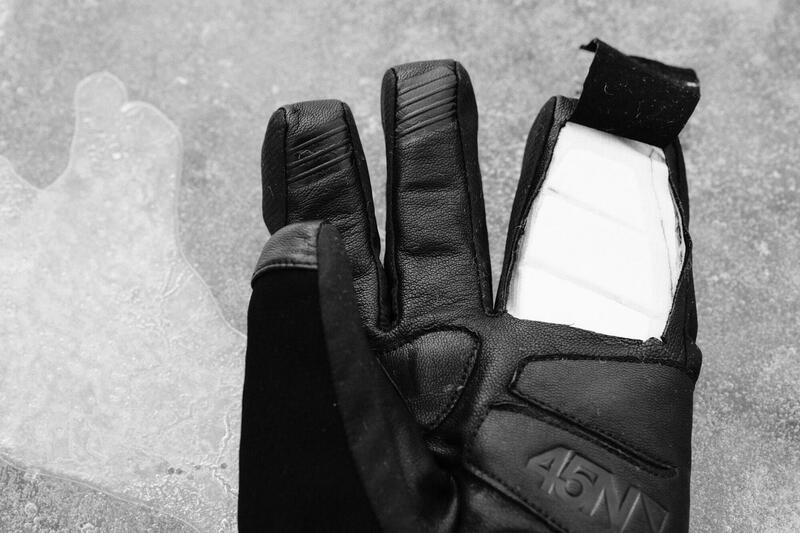 In this article we are going to share the concept behind the 45NRTH Sturmfist 4 glove, the technology used, and the unique performance benefits it brings to our community. Every product concept needs a defined set of challenges to overcome before design begins. Perspiration vapor, warmth, conduction and protection are the key barriers to overcoming cold hands and fingers while winter cycling. We needed gloves that were as breathable as possible, effectively manage moisture, and provided warmth and protection against the elements. Lets first focus on moisture management. As your body warms from aerobic activity, your hands can sweat and produce vapor. 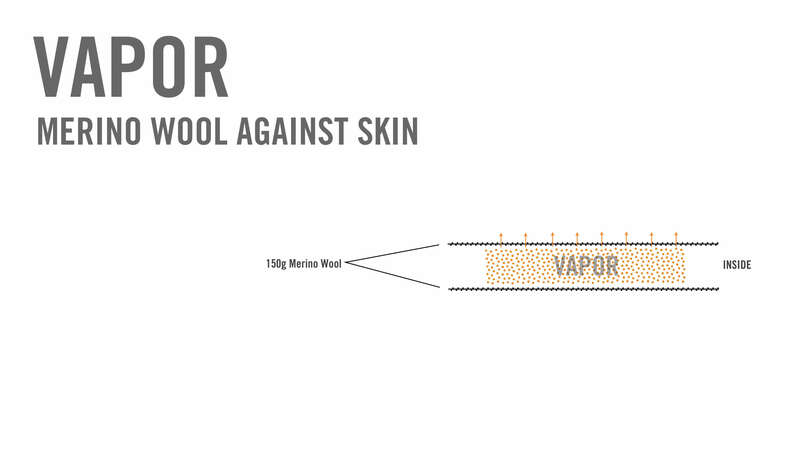 When this happens, you need the best fabric against your skin for wicking that moisture away. Our first prototypes of the Sturmfist 4 gloves were made in versions with polyester fleece lining, and merino wool lining. Both versions were field tested in sub-freezing Minnesota conditions, with the polyester fleece on the left hand and merino on the right. The merino prototypes emerged the clear winners. After 30 minutes of riding you could feel a wetness against your skin with the polyester fleece, and an almost immediate cooling down of your hands, while the hand with the merino felt dry and warm. This is why we chose to use merino lining through our entire Sturmfist line. In the below cut-out photo you can see the merino lining. With vapor management solved, we needed a way to preserve warmth. This where a premium lofted insulation comes into play. Real goose down loses its insulation value when wet. Knowing that the merino would be pushing vapor through to the lofted insulation layer, we needed a synthetic insulation that breathes very well. Polartec’s Alpha Insulation is regarded in the outdoor industry as the warmest, most breathable insulation for active winter sports. 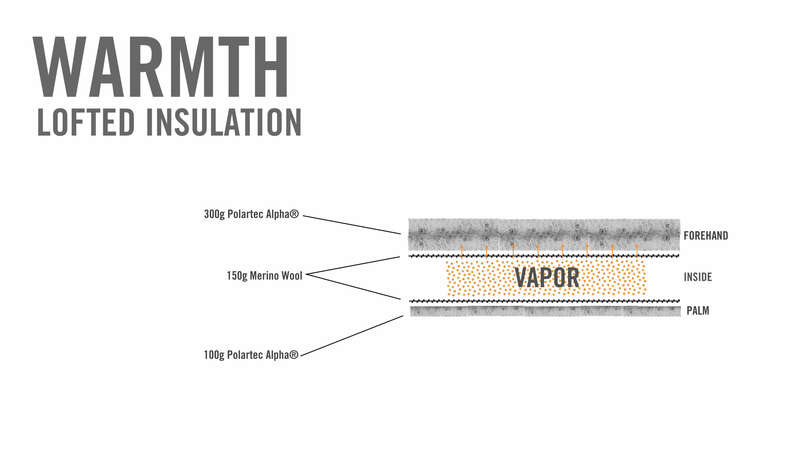 It has a very open construction for air exchange, which promotes moisture transfer and evaporation. Using a thick 300 gram layer would give us the warmth we needed, AND assist with moisture management! 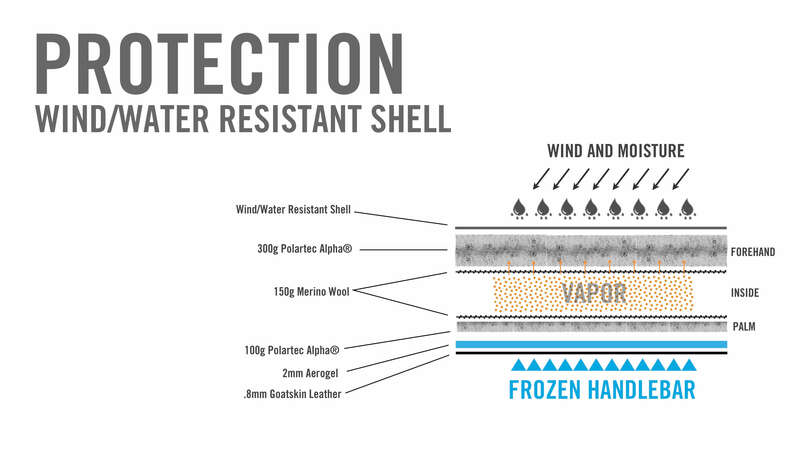 This is why we chose to use Polartec Alpha on the other side of the merino lining. You can see the open structure of the Alpha insulation in the next photo. A particularly unique problem for winter cycling comfort is cold handlebars. When it is far below freezing, aluminum handlebars are super cold and will pull heat away from your fingers. We refer to this as “conduction”. 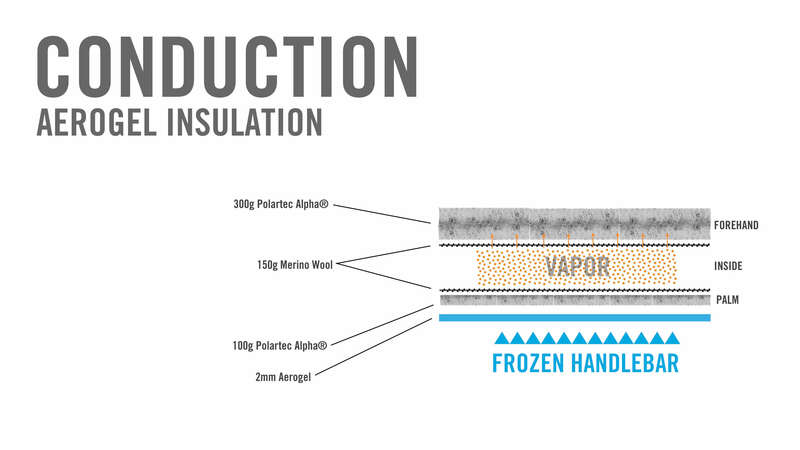 Like metal cleats in our footwear, we needed a way to reduce or eliminate conductive heat loss from cold handlebars. 45NRTH was the first to use Aerogel in cycling footwear. 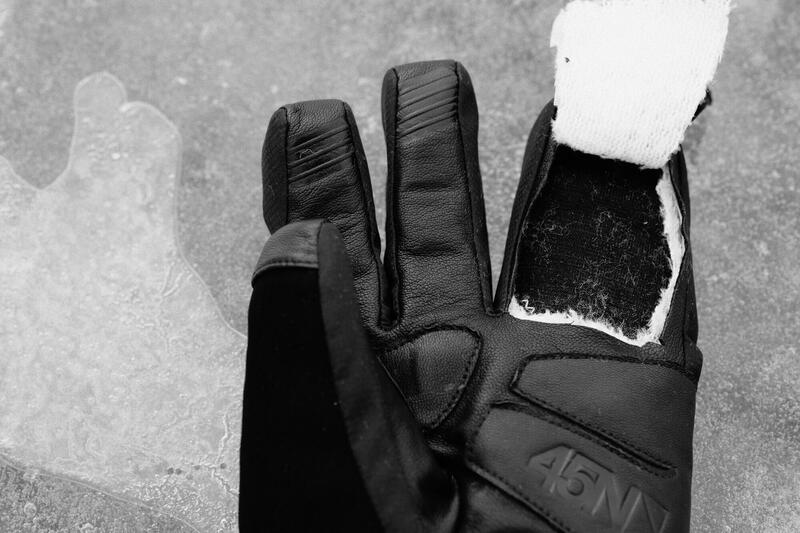 It worked so well in our boots it only made sense that we would figure out a way to use it in our premium winter cycling gloves. 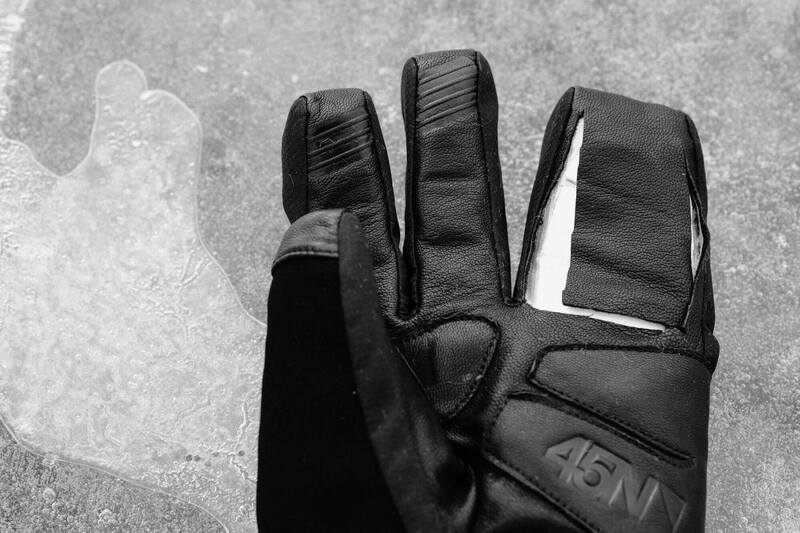 After more than a year of initial development, we created custom panels of laminated Aerogel for our Sturmfist 4 gloves so our customers would never have to feel cold handlebars again. Panels of our Aerogel raw material are shown below. Protection from wind, snow and other weather elements is a need shared across all categories of winter gloves. When you add cycling to the picture, we need a forehand shell that blocks wind, breathes as much as possible, and is resistant to abrasions and tears. Our shell material is backed with a coating to cut the wind, but we intentionally do not tape the seams to make the gloves waterproof. Breathability is more important for comfort in aerobic activities, and making the gloves waterproof would have undermined comfort. 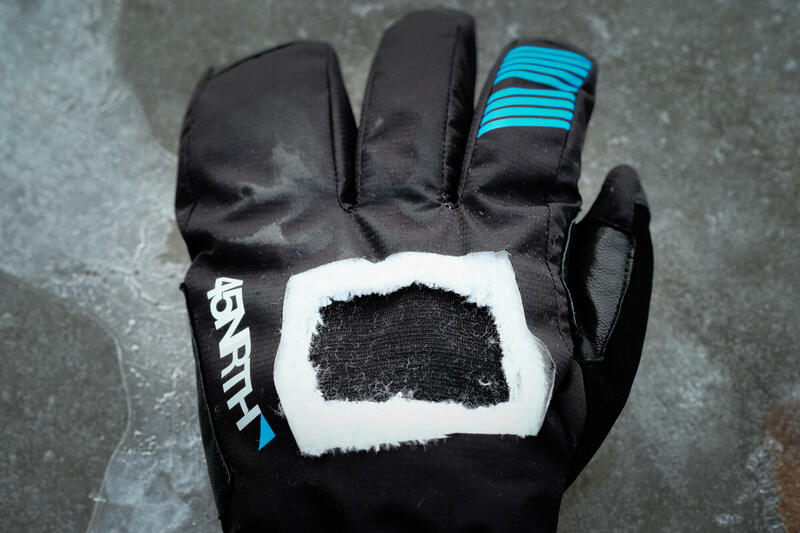 The below photo shows the shell material protecting the 300g Polartec Alpha Insulation, with the merino lining on the inside against the hand. In the palm, we needed a durable, flexible and grippy material to take on the elements. A premium .8mm goatskin leather achieves all of these things. 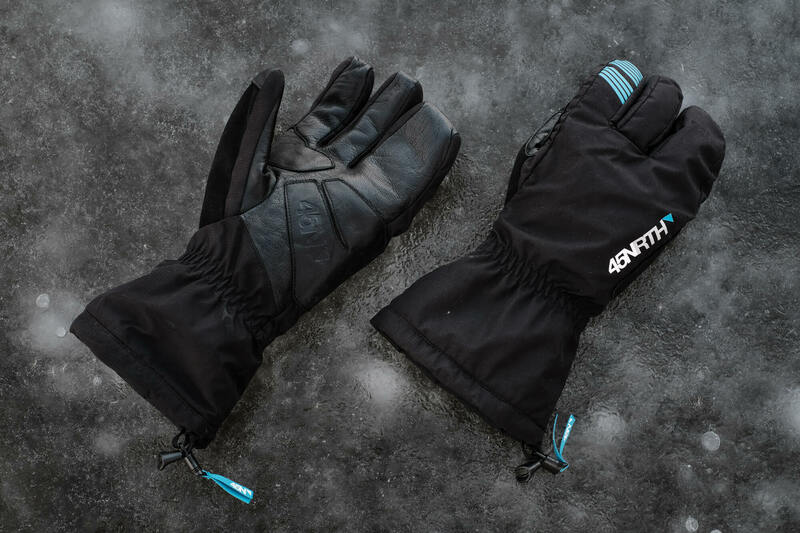 In addition to the materials package, special consideration needed to be given to the physical design of 0-15°F (-18 to -9°C) winter cycling glove. The large gauntlet wrist fits over jacket sleeves, and seals shut with an elastic cinch cord. This eliminates the possibility of exposed skin at the wrist. The 4-finger lobster style approach keeps the pinkie and wring fingers together for added warmth, while the index and middle fingers remain free to operate shifter and brake levers. The large single panel on top of the hand reduces the number of seams where wind can enter through the shell, and the leather gusset in the crotch of the hand between thumb and index finger reinforces the glove in the highest stress area of the glove. Overall, the physical design attributes, combined with the premium material package in the Sturmfist 4 produces unrivaled performance in any other winter cycling glove. 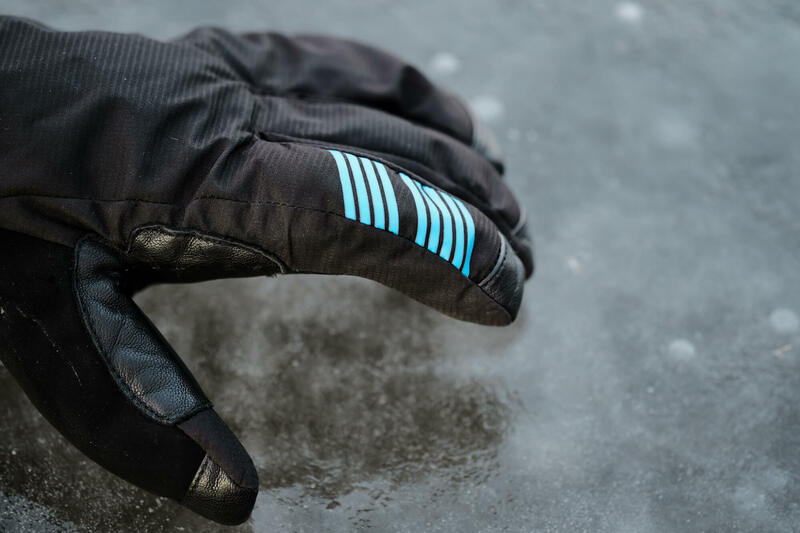 Everything we put into the glove is intended to keep you warm, dry and comfortable so you can enjoy riding in the extreme cold.